In 2013 Madison County Historic Preservation Commission wrote and received a Certified Local Government Grant ($11,900) from the Iowa Department of Cultural Affairs. Leah Rogers, of Tallgrass Historians, L.C., was hired to write an Intensive Survey and Evaluation of the buildings in a ten block area surrounding the courthouse. The Survey and Evaluation process was the first step in determining whether or not Winterset’s commercial buildings were a likely candidate for an historic district nomination. A group of 11 local volunteers (Roslea Johnson, Linda Smith, Sally Oldham, Ron Howell, Jean Fifo, JoAnne Walker, Jared McDonald, Beth Gray, Carol Liechty, Molly Clause, and Brenda Hollingsworth) met each Wednesday at the Madison County Historical Museums Resource Center to perform research related to the project. The group also logged many hours in fieldwork, meeting downtown to write detailed descriptions of each building’s exterior and interior features. The survey was completed in 2014. 104 buildings were inventoried. It was concluded that a National Register-eligible historic commercial district is present, with the recommended boundary encompassing 83 buildings, of which 79 are contributing and only 4 are non-contributing. Copies of the Survey and Evaluation Report are available to the public at the Winterset City Library and the Madison County Historical Museum. By the time Phase One was completed in May of 2014, volunteers had accrued 2,116 hours (valued at $36,433) of time spent researching, recording and photographing Winterset’s Courthouse Square Commercial District. The total value of the project was $49,500 ($11,900 grant + $1,200 cash match + $36,433 in-kind match of volunteer u). 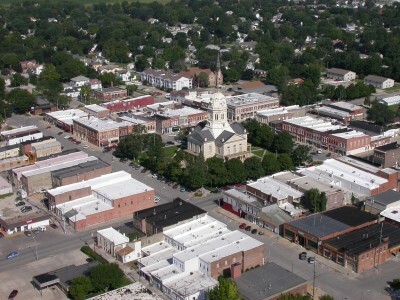 The project successfully established the Winterset Courthouse Square Commercial District’s eligibility for National Historic Register nomination, thus paving the way for Phase Two. In 2014 Madison County Historic Preservation Commission received a Historical Resource Development Program (HRDP) Grant ($8000) to write the nomination of Winterset’s Courthouse Square Commercial District to the National Register of Historic Places (NRHP). Total value of the project including local volunteer hours (895 @ $7.25) and cash match ($2,510) was $17,000. Consultant Leah Rogers was contracted to write the nomination and “shepherd” it through the review and revision process. The draft version was completed in December of 2015 and was signed by the National Park Service review board on December 22, 2015. Copies of Winterset’s Courthouse Historic District nomination are available at the Winterset Public Library and the Madison County Historical Society. Currently research is underway on a local level to answer questions raised in previous research. One of those questions, “What role did the residents of Madison County play in the Underground Railroad?” has led to some surprising finds. Local researchers have added 35 known individuals to the 30 already recognized by the State Historic Preservation Office as associated with Madison County’s Underground Railroad. Once our local team established residences for each person it was possible to reconstruct a probable south to north route and a probable west to east route for moving “Freedom Seekers” to adjacent counties. This information was included in the National Register nomination because it’s an important element in Winterset’s early political, social and commercial development. In addition, the Underground Railroad (UGRR) findings have been chosen as an area of focus in 2016. A study will be undertaken to determine if the UGRR research merits any location or trails that should be nominated for the National Park Services “Trail to Freedom” designation. Click for more information about the Underground Railroad in Madison County.